How could iPhone MMS crash AT&T's network? The iPhone may be the most advanced handheld computing device in the world, but you can flummox it pretty easily: for example, try to get a picture sent from your friend’s cell phone via the Multimedia Messaging service (MMS). But that may not long be the case every place in the world, according to a presentation by iPhone provider Telia Sonera. As MacWorld Sweden reports, Telia Sonera, which is partnered with Apple to distribute the iPhone in Denmark, Sweden, Finland, Norway, Sweden, Estonia, Latvia, and Lithuania, gave a presentation earlier this week that specifically says MMS is part of the company’s “next phase” for the iPhone. 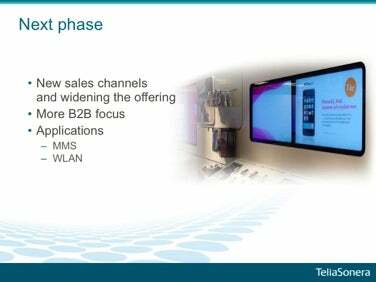 A slide from a recent Telia Sonera presentation suggests MMS support for the iPhone is forthcoming. The MMS application in question may not come from Apple or Telia Sonera, however, but rather appears as though it will be developed by a third party. That third party could be Mobispine, a Swedish company that announced an MMS iPhone application targeted at mobile phone operators on Wednesday. It's unknown at this point when the MMS service might roll out, in which of Telia Sonera's countries it might be deployed, or whether it might make its way to other iPhone service providers. Lack of MMS support has been a complaint of iPhone users ever since the first version of the device shipped in July 2007. While there are potential workarounds to send and receive pictures via email, many users remain frustrated at having to work around something that most common phones can do just fine.